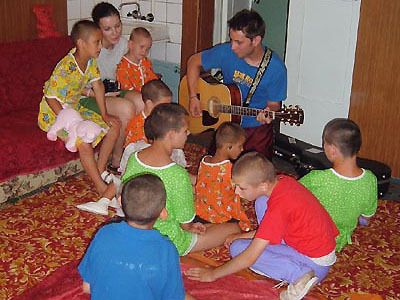 There are so many stories that I would love to share with the readers of this article about the 2005 College Student Mission Trip to the orphanages of Ukraine, however, the pictures that accompany this article do a much better job telling the readers about the faithful of the Ukrainian Orthodox Church of the USA, and what their love and financial help can do for the lives of over 250 children in two orphanages and eleven people of this year's mission team of the Church. The eleven members of the team returned to their homes on August 26 of this year after spending two weeks in Ukraine. Nine young adults from the parishes of the Ukrainian Orthodox Church of the USA had worked and played with the orphans, assisted the orphanage staff in their daily responsibilities and observed the state and needs of the homes for handicapped orphaned children in Ukraine. Five years ago, the UOC of the USA in partnership with the Children of Chornobyl Relief Fund (CCRF) adopted two orphanages in Ukraine. Orphanages in Znamianka, Kirovohrad Province and in Zaluchya, Ivano-Frankivsk Province were selected because the homes were in particularly deplorable condition, housing children with physical and mental birth defects. Mrs. Nadiya Matkiwska, Co-Founder of CCRF, who joined His Eminence Archbishop Antony in his personal meeting with the Mission Team members prior to their departure to Ukraine, explained that though these orphanages are located far away from Chornobyl', the effects of the Chornobyl' tragedy spread throughout every region of Ukraine as over 650,000 people from all corners of Ukraine assisted in the cleanup effort in 1986. According to the Ministry of Health of Ukraine, oncological diseases (tumors) among children in Ukraine tripled from 1986 to 1994. Our mission journey was organized by the Consistory of the Ukrainian Orthodox Church of the USA - Offices of Youth and Young Adult Ministry - Natalie Kapeluck, Director - and Missions and Christian Charity - Fr. Deacon Dr. Ihor Mahlay, Director. 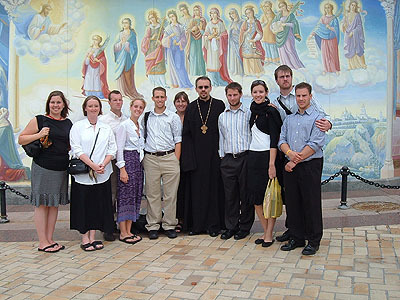 Both Natalie and Deacon Ihor were participants in the first missionary trip sponsored by the Church three years ago. This year's mission team consisted of nine students: Laryssa and Tanya Tchaikowsky of St. Vladimir Cathedral, Chicago, IL, Jared Burgan, Holy Ascension Parish, Clifton, NJ, Hans Harasimchuk and Michael Nakonachny of St. Vladimir Cathedral, Parma, OH, Kathrine Kosiv of Holy Trinity Parish, New York, NY, Jason and Eric Senedak of Sts. Peter and Paul Parish, Youngstown, OH, Katherine Holowchak, Ukrainian Catholic Diocese of Parma, OH and two leaders/advisors, Iryna Mahlay, St. Vladimir Cathedral, Parma OH and myself, Fr. Daniel Zelinsky, Director of the Consistory Office of Public Relations. Prior to Mission Team's departure for Ukraine, His Eminence Archbishop Antony celebrated a Moleben in the Consistory Chapel and offered special prayers for all mission team members and for the success of their missionary efforts. His Eminence spoke about love and its everlasting ability to change people's lives if they let the Light of Divine presence to enter into and flow through them into the lives of others. He concluded saying that love never permits people return to their old selves, once experienced and that the team members experience in the orphanages will change their lives forever…and how prophetic his statements were! In Znamianka, where 120 children live, almost all of whom have serious physical and mental problems including Downs Syndrome, autism, a host of physical deformities and developmental problems, among others, the Mission Team provided the children with basic physical therapy, playing with, cuddling and lovingly hugging as many of the children as possible. The team also painted anew Arts and Crafts room, using Disney theme: Under the Sea. In Zaluchya, the Mission Team did it all again, in Christ's Love, at the orphanage, which is home for 140 children. As in Znamianka, the vast majority of the children were born with physical and mental birth defects such as Down's syndrome or cerebral palsy. This home is a former family estate built before World War II and still in need of some major improvements. A new roof, new bathrooms with multiple showers, sinks in every room and a laundry, along with new beds, mattresses and linens have been provided through the financial support of the faithful of the UOCUSA. Although many improvements have been made, much more needs to be done. We completed our stay in each orphanage with a special healing service, during which the children who were mobile prayed with us and received a blessing of healing oils from Father Daniel. While Fr. Daniel visited the rooms of the children who could not attend the service, the rest of the team spent quality time with the children in attendance and the staff of the orphanages. Tanya Tchaikovsky, one of the Team members recalls this: "Then, while in Zaluchya, after another moving service of Holy Unction each of the children was anointed, and was given an icon card of the Virgin Mary. All of the kids loved the gifts, and I saw many kissing the icons, and many more asked us to kiss them. I was sitting with Ulyana, a brilliant girl who has learned to write and paint by grasping instruments in her teeth, and Vasyl, a quiet, patient little boy who has little use of his legs, and I was holding Alina, a very young girl with Down's syndrome in my lap. Ulyana turned to me and asked me to read to her what was written on the back of the icon card. I hadn't really paid attention to the back until this point. There, written in Ukrainian, were the Beatitudes. I started reading them to the kids, and by the time I had reached the end, I was in tears. I realized that these children truly are blessed. They are poor, meek, they mourn; they are all of these things. I was crying tears of joy because I realized that though they may face great hardships in their lives on earth, 'great will be their reward in heaven." During the visits to the orphanages, the directors and staff were very hospitable and grateful for our Church's support and efforts, especially the actual physical presence and assistance of the mission team members. The staff members were also open and frank about their difficulties and needs in providing for the children. Not only did the administration of the orphanages provide meals and lodging for the mission team, but they took the team on cultural excursions. In Znamianka, the members visited the city. In Zaluchya, the team visited Kosiv and the ethnographic bazaar in the foothills of the Carpathian Mountains. After completing their all-too-short (according to the team members) Christian work at the orphanages, the mission team spent a few days touring historic Lviv. On the way back to Kyiv they made a pilgrimage to Pochaiv Monastery-Lavra, venerating the miraculous icon of the Mother of God and relics of St. Job. In Kyiv, the group visited the Kyiv-Pechersk Lavra venerating the relics of many saints buried in the caves, St. Sophia Cathedral and St. Michael's "Golden Domed" Cathedral, which has been magnificently reconstructed with the support of many of the faithful in the USA. Steven Haluszczak, a 2004 mission team lay leader recalls following: "group members often asked ourselves "Why are we so lucky? We have parents who love us and have given us so much materially. Why do these children have so little? It just isn't fair." These are questions for which we have no answers. And they are questions we will wrestle with perhaps for the rest of our lives. Our trip was truly a life-changing experience. None of us will be the same after our time in the children's homes. But this is truly another positive outcome of our experience. As we go about our every day chores, it is very easy to overlook the pain and suffering of our fellow man. It is very easy to get caught up in our own worries and not heed the command of our Lord to "Love one another. As I have loved you, so you must love one another." (John 13:33-35)". The members of our mission team gave love and have already received a hundred-fold reward of love and increased understanding. The Ukrainian Orthodox Church of the USA and the Children of Chornobyl Relief Fund have had a tremendous impact on the lives of these handicapped and orphaned children. The visit and work of the mission team underscored the commitment the Church has made to these institutions. The work of the Church in such outreach must continue for our Lord has called us to love even the least of His children. We look forward to many more such missionary efforts to these orphanages and to other such institutions, both in Ukraine and in the USA.